Analysis by Kevin Woodley indicates each goalie benefitted from tight defensive structure during the Chicago Blackhawks' 2-1 victory against the Tampa Bay Lightning in Game 1 of the Stanley Cup Final. Chicago Blackhawks' forward Teuvo Teravainen showed composure beyond years in Game 1 of Stanley Cup Final. Jon Cooper has a movie-inspired rule that involves winning in his second year as coach, and he's poised to continue it with the Tampa Bay Lightning. Co-chairs of the NHL / NHLPA Competition Committee issued the following statement on new rules recommendations after the Competition Committee met today in New York. The Ottawa Senators and coach Dave Cameron have agreed to terms on a new two-year contract. Forward Eric Fehr had successful elbow surgery Wednesday, the Washington Capitals said. The Toronto Maple Leafs have signed forward Andreas Johnson to a three-year entry level contract. The Leafs have also re-signed defenceman T.J. Brennan to a one-year contract. Ron Wilson was named the coach of the 2016 United States National Junior Team on Thursday. TSN hockey insider Bob McKenzie was named the 2015 winner of the Elmer Ferguson Memorial Award for excellence in hockey journalism, and Los Angeles Kings radio voice Nick Nickson the winner of the Foster Hewitt Memorial Award for outstanding contributions to broadcasting, the Hockey Hall of Fame announced in a release on Thursday. The Tampa Bay Lightning's defensive strategy in Game 1 may lead the Chicago Blackhawks to split up top forwards Jonathan Toews and Patrick Kane. The Tampa Bay Lightning tried to win a 1-0 game against the Chicago Blackhawks in Game 1 of the 2015 Stanley Cup Final. It didn't work. 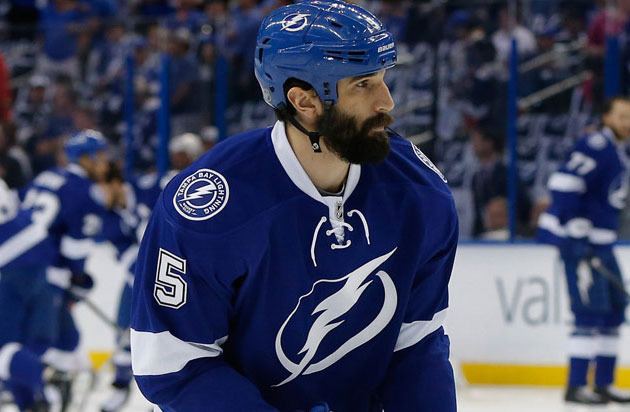 In his latest blog for NHL.com, Tampa Bay Lightning forward Jason Garrison discusses his beard that has been a storyline during the Stanley Cup Playoffs. Tampa Bay Lightning forward Brian Boyle is angered over a missed opportunity in a Game 1 loss to the Chicago Blackhawks. Edmonton Oilers head amateur scout Stu MacGregor knows it's a unique opportunity to pick No. 1 in a draft headlined by Connor McDavid and Jack Eichel. Chicago Blackhawks rookie defenseman Trevor van Riemsdyk could play in Game 2 of the Stanley Cup Final, coach Joel Quenneville said Thursday. Washington Capitals assistant GM Ross Mahoney discusses the impact to be made by Connor McDavid and Jack Eichel. Buffalo Sabres president Ted Black said the organization is very happy to be hosting the 2015 NHL Scouting Combine. Erie Otters forward Dylan Strome is ready to help younger brother Matthew adjust to the OHL the say way older brother Ryan helped him. Saint John defenseman Thomas Chabot has had an interesting, and surprising, stay at the NHL Scouting Combine. For more 2015 NHL Combine coverage, follow NHL.com's blog.